On a recent Wednesday morning, under the gaze of a mounted bison head, Native American tribal leaders filled the Senate Indian Affairs Room for their annual legislative summit. They'd been there many times before, asking for fixes to the laws that govern their existence. This time, however, brought more than the usual sense of unease. After years of poking at the issue, Senate Majority Leader Harry Reid is serious about legalizing online poker, allowing states to opt in to a federally regulated system that would give them 14 percent of poker proceeds. He’s said it won’t happen before the end of the year, but the easiest way to get it done might be to attach it to a must-pass bill like the defense authorization—and in a lame-duck session, you never know what might make it to the president’s desk. Native-friendly politicians cycled through 628 Dirksen to reassure the assembled leaders, some sporting beaded or patterned accents to their halls-of-government drab, that any law change would take tribal interests into account. "If you're going to do Internet gaming, do it fairly," said the snowy-haired Virginia Rep. Jim Moran, to nods of approval from the audience. "Don't try to pull something where Las Vegas casinos get preferential treatment. We don't want them to get any advantage, even if it's from their perspective." Despite Moran's exhortation, the tribes have reason to worry. Over the past 25 years, state compacts granting exclusive rights to operate casinos have allowed for the greatest advances in tribal welfare ever. (The 1988 law governing Indian gambling basically requires that federally recognized tribes be granted a strong advantage; Vegas and Atlantic City only exist because there are none in Nevada or New Jersey.) Analysts estimate that online poker won’t drag too many customers away from casinos that provide a wider entertainment experience, beyond gambling. But if poker is legalized nationally, that new online audience will have a lot more websites to choose from than the ones run by the tribes. Still, there's an even bigger risk for the Indian nations. Gambling, after all, was never an equal-opportunity business: It benefits those blessed with reservations close to large cities. The 480-member Shakopee tribe grows rich off the Twin Cities, for example, while the Oglala Sioux stay poor in South Dakota. The Internet economy always carries the hope that physical location will cease to be a handicap, allowing anybody with a broadband connection to disrupt entrenched businesses. As it turns out, having a lucrative physical gambling operation is the best preparation for setting up a lucrative virtual one—which means the new frontier of Internet gaming is likely to reinforce tribal inequality, rather than ease it. AFTER FIRST OPPOSING online gambling entirely, the tribes have come around on the idea. It's not hard to see why. 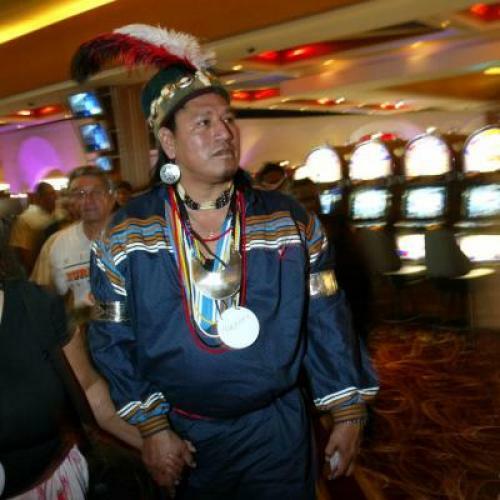 Tribal casino revenues nationally topped out in 2007 at $26.7 billion. Most of the tribes allowed to build casinos have done so, and cash flow has declined particularly in states where the industrys most mature, like Florida and California. Meanwhile, legal online gambling seems inevitable: The National Indian Gaming Association has commissioned multiple reports on the issue, encouraging the tribes to get online just like everybody else. "We all realize the future of gambling is the younger generation, with online gambling and mobile apps," NIGA executive director Jason Giles said at a September gathering at the Seminoles' Hard Rock Casino in Hollywood, Florida. That may work fine for gambling pros like the Seminoles—or the Mohegans in Connecticut, who’ve already inked a deal with the online poker provider OnGame, and will flip on the switch as soon as Congress legalizes it nationwide. Theoretically, smaller tribes could benefit, too, either by joining larger ones or by forming their own consortiums to generate the kind of liquidity that any gaming operation needs to pay out attractive winnings. W. Ron Allen, chairman of Washington State's Jamestown S'Klallam tribe, imagines that Native kids could busy themselves designing gambling apps, giving them a ticket to Internet wealth. "Where does the ingenuity of the free market come from? It can easily come from Indian country," Allen says. "These young kids are not interested in fishing. They're more interested in this new tech world, and saying, 'I can make money here.' You're gonna see 'em starting to emerge and shift in terms of vocational skill sets." It's a lovely vision, but likely won't come to pass, for three reasons. One: Reid's draft bill would ban all forms of online gaming other than off-track betting and poker, an approach both tribal and non-tribal casinos favor because those games don't cut into slot machines, where casinos make most of their money. Outside the Senate hearing room, representatives from the Mohegans of Connecticut and the Mississippi Choctaw—with a practiced lobbyist’s quick and facile patter—talked about how legalizing all kinds of gambling online would crush their brick-and-mortar business. "Ten thousand people rely on us," says Charles Bunnell, the Mohegans' chief of staff. "We really believe that you'll see an erosion of jobs if you can play any game you can think of on the Internet." That's a pretty good way to preserve their monopoly—there are only so many ways to play poker, leaving little room for disruption by app-developing upstart tribes. Two: Reputation and size matter. Steven Light, co-director of the University of North Dakota's Institute for the Study of Tribal Gaming Law and Policy, says that smaller, poorer tribes lack the resources to develop the kind of infrastructure you need to run and market a sizeable online gaming platform. Even if small tribes banded together, they’d be competing with big casinos that have spent a long time building powerful brands, which gamblers will trust when jumping from a physical card table to a virtual one. "The online gaming world is going to reinforce the haves and have-nots," says Light. "Where are you likely to go? You're likely to go to Google for your info searches. We don't go to a tiny startup site that I can't even think of. You're driven to the big players, and that's what's gonna happen with online gaming." And three: In trying to get some form of online gaming passed, the big gaming tribes might talk about allowing smaller ones to join them (Bunnell dangled the possibility, and Allen of the S’Klallam said some tribes are betting on it). But actually, there's very little reason for the Mohegans, or the neighboring Mashantucket Pequots—who operate the Foxwoods Resort Casino—to share the eggs from their golden goose. "Why in the world would the Pequots partner with the Standing Rock nation here in North Dakota? Why would they do that?" Light asks. "There's no incentive to do that." Tribes, after all, are independent nations, just like American states—they might lobby together on the Hill, but back on the reservation, their own members come first. "People sometimes say, 'Why don't the tribes just help each other?'" says Light. "How often have you seen California reach out to Connecticut and say, 'Hey, let's band together and share our revenue?'" A totally open gambling marketplace might help those tribes that have suffered even more than the average Indian nation, by allowing for innovation of the sort that allows underfunded newbies to take on entrenched incumbents. But the way things are looking now, with only poker—if anything—up for legalization, the U.S. regulatory system will continue to privilege well-located tribes over their less-fortunate peers.American law doesn’t protect brick-and-mortar businesses against the Internet in other sectors of the economy. Perhaps it shouldn’t in this one, either.